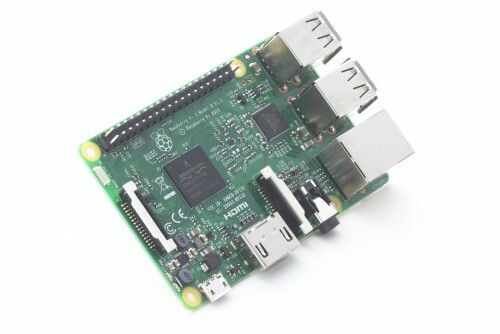 Raspberry Pi 3 announced for $35 with Bluetooth, Wi-Fi and 64-bit processor. The Raspberry Pi Foundation has today announced the availability of Pi 3 for $35 (the same price as the existing Raspberry Pi 2) with Bluetooth, Wi-Fi and 64-bit processor. The Pi 3 is available to buy today from Raspberry's partners element14 and RS Components, and other resellers. The Pi 3 features a 1.2GHz 64-bit quad-core ARM Cortex-A53 CPU (~10x the performance of Raspberry Pi 1), integrated 802.11n wireless LAN and Bluetooth 4.1 and compatible with Raspberry Pi 1 and 2. For Pi 3, Broadcom have supported Raspberry with a new SoC, BCM2837. This retains the same basic architecture as its predecessors BCM2835 and BCM2836, so all those projects and tutorials which rely on the precise details of the Raspberry Pi hardware will continue to work. The 900MHz 32-bit quad-core ARM Cortex-A7 CPU complex has been replaced by a custom-hardened 1.2GHz 64-bit quad-core ARM Cortex-A53. Combining a 33% increase in clock speed with various architectural enhancements, this provides a 50-60% increase in performance in 32-bit mode versus Raspberry Pi 2, or roughly a factor of ten over the original Raspberry Pi. Wireless functionality built into very nearly the same form-factor as the Raspberry Pi 1 Model B+ and Raspberry Pi 2 Model B; the only change is to the position of the LEDs, which have moved to the other side of the SD card socket to make room for the antenna. All of the connectors are in the same place and have the same functionality, and the board can still be run from a 5V micro-USB power adapter. This time round, they're recommending a 2.5A adapter if you want to connect power-hungry USB devices to the Raspberry Pi.